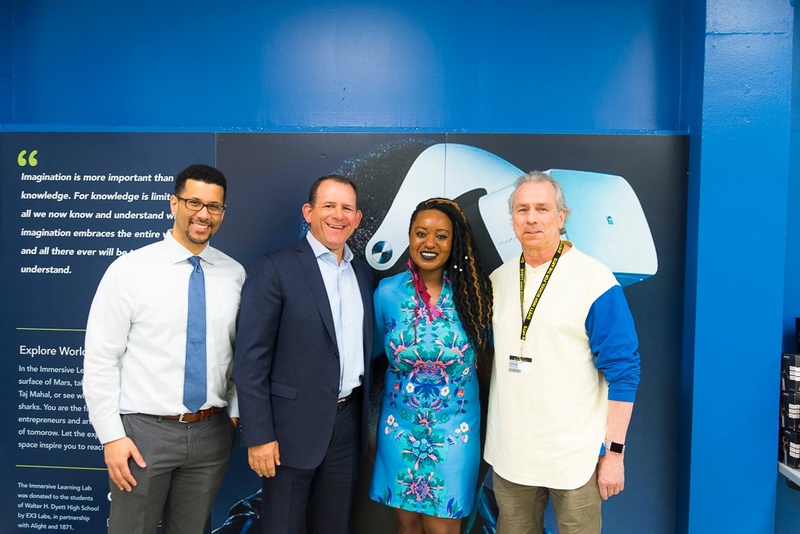 From L to R: 1871 Business Development Manager Colleen Maxwell, EX3 Labs CEO Adam Wisniewski, Dyett High School Principal Beulah McLoyd, Former 1871 CEO Howard A. Tullman, and Alight Solutions CEO Chris Michalak. 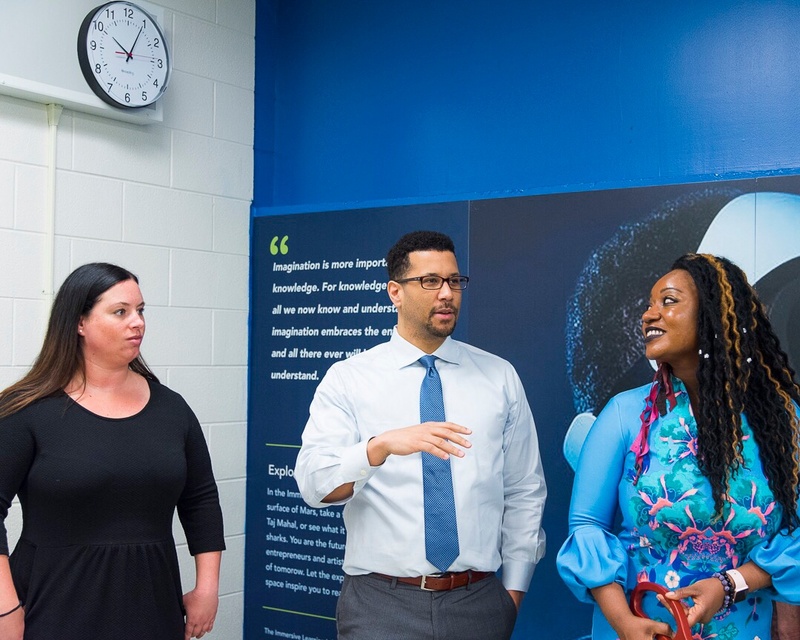 Chicago tech startup EX3 Labs recently partnered with 1871 and Alight Solutions to donate an entire Immersive Learning Lab to Walter H. Dyett High School For the Arts. The donation is the second such contribution between EX3 Labs and 1871 -- just last year, both organizations collaborated to donate a similar learning lab to George M. Pullman Elementary School. EX3 Labs' ultimate mission is to donate an Immersive Learning Lab to a Chicago Public School for every Innovation Day held in partnership with 1871's Corporate Innovation Program. EX3 Labs CEO Adam Wisniewski discusses the value of technology as an educational resource for students of all ages. Students at Dyett High School try on EX3 Labs' suite of virtual reality equipment. 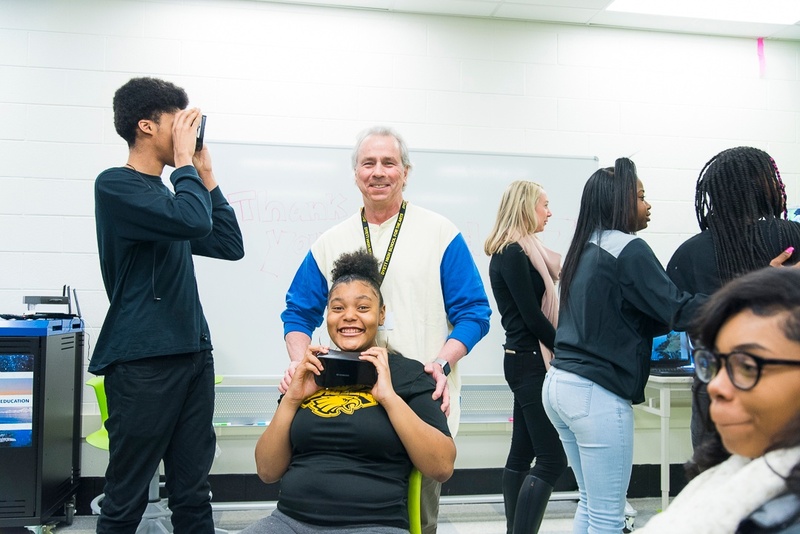 1871 CEO Howard A. Tullman shares a smile with students at Dyett High School as they engage with a virtual reality device. 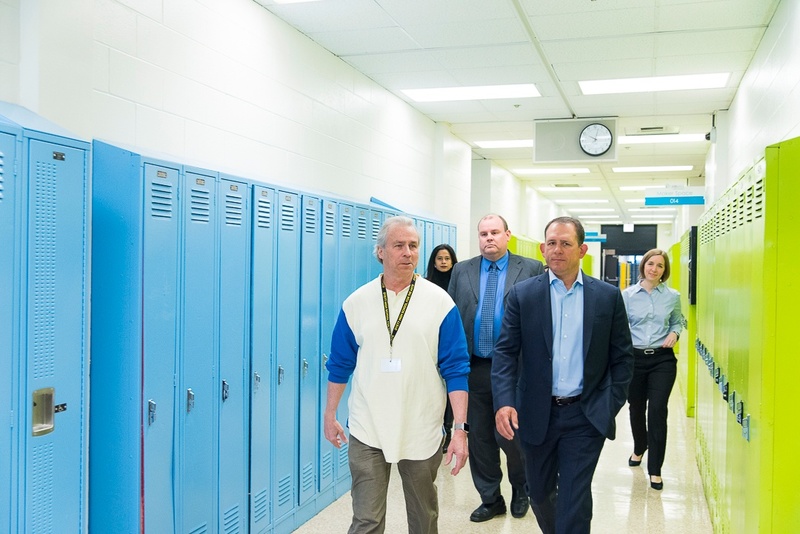 Howard A. Tullman and Chris Michalak of Alight solutions tour the facilities at Dyett High School. “The pace of change is more rapid now than ever before. To keep up with that evolution and thrive as a community, we have to cultivate an environment of curiosity, learning and innovation, and that starts with ensuring our kids have access to experiences like the Immersive Learning Lab. 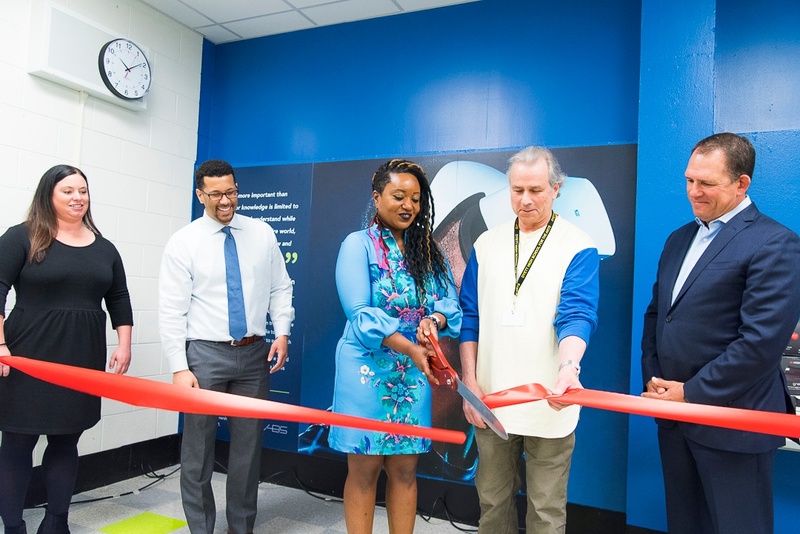 We are thrilled to partner with EX3 Labs and 1871 to provide this unique learning environment to the students of Dyett High School.” – Chris Michalak, CEO, Alight solutions. Wisniewski, Michalak, McLoyd, and Tullman take a photo to celebrate the donation. 30 Google Expedition devices and VR viewers. More than 750 learning expeditions for students to experience in the sciences, art, history, and more. One Microsoft Mixed Reality headset. 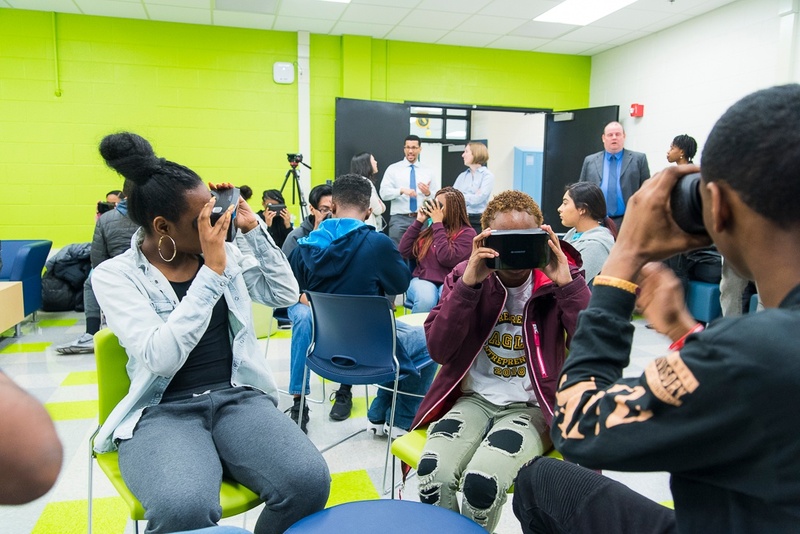 Students at Dyett High School experience EX3 Labs' suite of virtual reality equipment. A big thanks to EX3 Labs and Alight Solutions for this donation and their shared commitment to our core values of community, education, and inspiration. To learn more about EX3 Labs' Immersive Learning Lab donation, read the full press release here.